The typescript examined in this exhibit includes Part One, Chapter Three of The Apprenticeship of Duddy Kravitz. It begins in the middle of Max’s retelling of the Boy Wonder’s exploits at Eddy’s Cigar and Soda shop, after Duddy has run away from Mr. Cox’s musical evening. Page 19 of the typescript begins midway through Max’s recounting of the Catholic hospital. Of the variants evident in this original typescript from the published text, it can be noted that Richler originally chose to call the Boy Wonder the “Boy Plunger”. Spelling variants of the French word "Rien" are written in the left margin, which signify the decision by Richler to include the French additions of "au revoir" and "Rien" to the published text. On the back of page 19, Richler wrote by hand an addition to Max and Duddy’s exchange about the events at school. This exchange highlights Max’s disapproval of Duddy, as he takes sides with his teacher rather than his son. 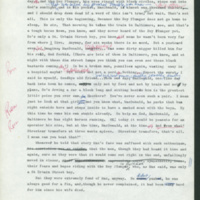 The typescript on page 20 reveals several significant deletions; Richler writes of Duddy’s sister Elsie, but removes all mention of her in the published version of the text. Additionally, Richler has also removed several sentences of description concerning Josette, the whore. Finally on page 22, Richler has deleted an alternative ending to the chapter. In the typescript, the chapter ends with Duddy running out of the store and venting his emotions. Duddy then goes to a pay phone and calls MacPherson’s house, but the line is busy, therefore removing all responsibility placed upon him concerning Mrs. Macpherson's death. In the published version of the story, the paragraph's deletion causes Duddy to experience remorse over the possibility that his phone call was responsible for her collapse and death.